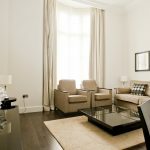 Luxury Serviced Apartments in Bayswater: Chilworth Court offers a selection of 20 spacious and bright serviced apartments, conveniently located for transport links, including Paddington Station and the Heathrow Express service. 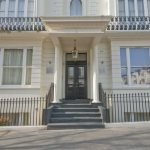 It’s also minutes from Hyde Park, fashionable Notting Hill and Portobello Market and the multi-cultural district of Edgware Road with its eclectic mix of restaurants, shisha cafés and nightclubs. And Oxford Street, one of London’s most famous shopping streets, is also within easy walking distance. 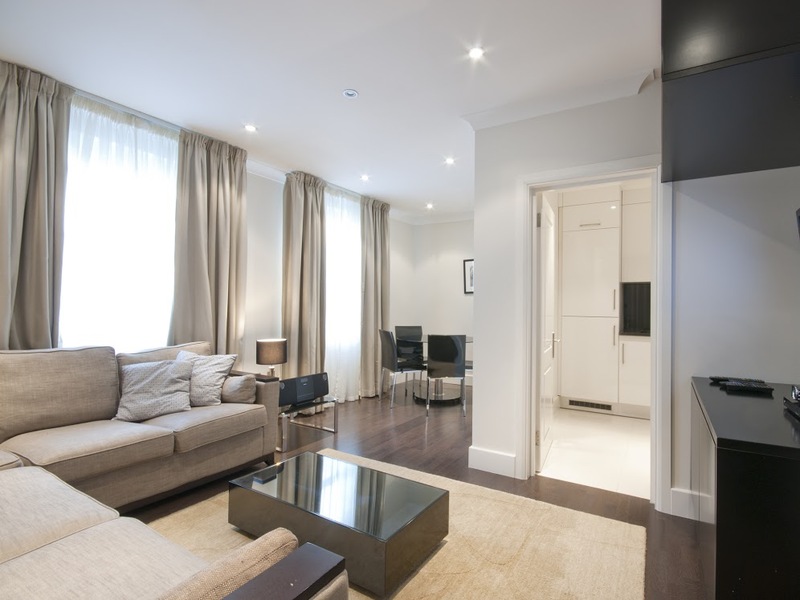 Studio apartments offering modern, open-plan living for the fuss-free visitor. 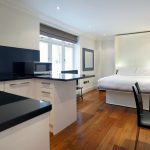 The combined Living/sleeping area includes a pull-down double bed and premium audio-visual system.The fully-equipped Kitchen includes all modern appliances and the Bathroom is fitted with bath and power shower. 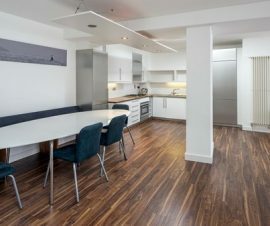 Studio apartments are located on the Lower Ground Floor and the First Floor with a separate OR attached Kitchen and a Super King OR King sized pull down bed. 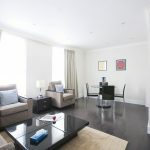 One Bedroom apartment located on the Lower Ground Floor providing modern luxury, comfort and additional space. The spacious Living/Dining area includes flat screen TV/DVD (with choice of free satellite channels) and premium audio-visual system. 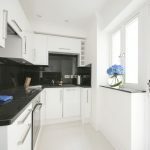 The fully-fitted Kitchen features modern appliances including dishwasher and a washer/dryer machine. The Bedroom is fitted a Queen-size bed and built in wardrobes for storage. The Bathroom includes bath and shower. 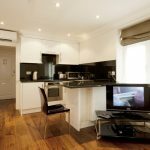 Superior One bedroom apartments are located on the upper floors, feature a good sized Living/Dining area, flat screen TV with Free satellite channels, and premium audio visual system. 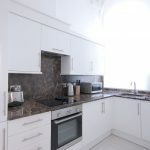 The fully fitted Kitchen includes, dishwasher, washer/dryer machine and the Bedroom is fitted with King sized bed and built in Wardrobes for storage. The Bathroom includes bath and shower and a bidet. 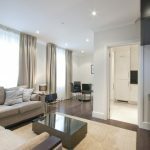 Two Bedroom apartments located on the Lower Ground Floor and feature high ceilings and contemporary design, ideal for family stays.The generous sized Living/Dining area includes flat screen TV (with choice of free satellite channels), premium audio-visual system. 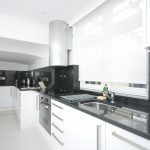 The modern Kitchen is fully equipped with the latest appliances including dishwasher and washer/dryer. 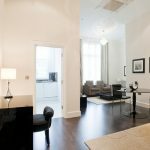 One Bedroom is fitted with a Super King-size bed and has en-suite facilities and the second Bedroom is fitted with a Queen-size bed. 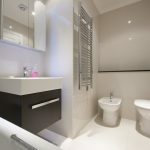 A second Bathroom includes bath and power shower. 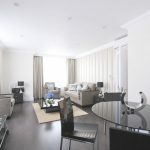 The generous sized Living/Dining area includes flat screen (with free satellite channels) and premium audio-visual system and the modern Kitchen is fully equipped with the latest appliances, including dishwasher and washer/dryer. 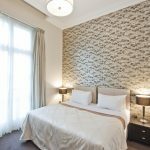 Bedrooms include Super King-size bed and a twin bedroom with 2 single beds that can be attached as second Super King size bed and the two Bathrooms are fitted with bath and power shower. 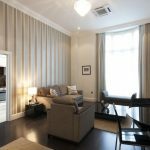 Deluxe Two Bedroom apartments feature more space, high ceilings and a small balcony area – ideal for family or extended stays. 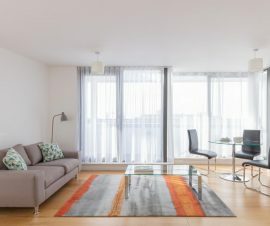 The generous sized Living/Dining area includes flat screen TV (with free satellite channels) and premium audio-visual system, and the modern Kitchen is fully equipped with the latest appliances, including dishwasher and washer/dryer. 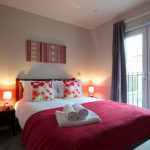 Bedrooms include Super King-size bed and a twin bedroom with 2 single beds that can be attached as second SuperKing size bed if required, apartments feature two Bathrooms (one en-suite) with bath and shower. 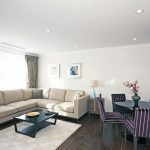 Three Bedroom apartment featuring more space and comfort – ideal for family or extended stays. 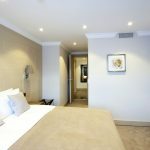 The generous sized living/dining area includes flat screen TV (with free satellite channels) and premium audio-visual system, and the modern Kitchen is fully equipped with the latest appliances, including dish­washer and washer/dryer. 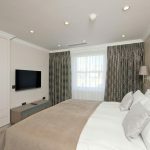 Bedrooms include Super King-size and King sized beds and a twin bedroom with 2 single beds that can be attached as second Super King size bed if required and there is one en-suite Bathroom and two further Bathrooms with bath and power shower.